Welcome to a sneak peek of our newest meme coming in March! Every Monday we will be sharing something from Booktube! This week we have a new release title called S.T.A.G.S by M.A. Bennett. This book has been deemed "Gossip Girl meets The Hunger Games." by Bustle and Hypable says that it's "Like Mean Girls, but British and deadly. . . . This book is great, from start to finish." So make sure to get ready for one deadly weekend, because this story is the twistest there is and would be great for fans of Pretty Little Liars and One of Us is Lying that explores just how far the elite at an English boarding school will go. So check out an excerpt and the book trailer below! And let us know how you love this newest meme in the comments below! I think I might be a murderer. Although, as I didn’t mean to kill, I suppose it was manslaughter, so technically I would be a “manslaughterer,” although I don’t think that’s a word. When I got my scholarship to STAGS, my old headmistress told me, “You’ll be the cleverest student in that school, Greer MacDonald.” I might be; I might not. But I’m clever enough to know that “manslaughterer” is not a word. I should make it clear here, before you lose all sympathy for me, that I didn’t kill with my own hands. There were a few of us. I helped to cause a death, but not alone. I’m a murderer in the way that foxhunters are murderers--they are each responsible for the fox’s death, even though they hunt in a pack. No one ever knows which dog tore the fox apart, but all the dogs, and all those riders in their smart red coats, are part of it. I just gave myself away. Did you spot it? Those coats--the coats that posh people wear out foxhunting--they are pink, not red; hunting pink. And the dogs are not dogs; they are hounds. Every time I open my mouth, I give myself away; Greer MacDonald, the Girl Who Doesn’t Fit In. It’s my northern accent, you see. I was born and raised in Manchester and went to Bewley Park Comprehensive School until this summer. In both those places I fitted in just fine. When I won my scholarship to STAGS, I stopped fitting in. I ought to tell you a bit about STAGS, because I now realize how connected the school is to the murder. 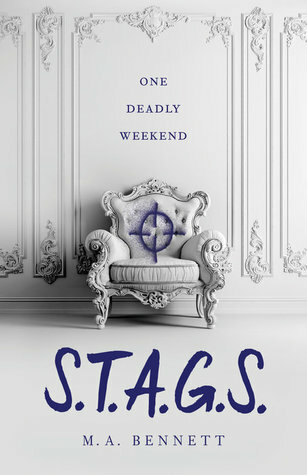 “STAGS” stands for “St. Aidan the Great School,” and it is literally the oldest school in England. Not a single building in my comprehensive school, Bewley Park, was built before 1980. The earliest bit of STAGS, the chapel, was built back in 683, and it is covered in frescoes. Frescoes. Bewley Park was covered in graffiti. STAGS was founded in the seventh century by the man himself. Saint Aidan the Great, I mean. Before the Church decided he was great, he was just a plain old monk, and he wandered around northern England telling anyone who would listen about Christianity. Then, presumably so he could stop wandering, he founded a school, where he told his pupils all about Christianity instead. You might assume that he was made a saint for all that telling people about Christianity, but apparently that’s not how it works. In order to become a saint, you have to perform a miracle. Aidan’s miracle was that he saved a stag from the hunt by turning him invisible. So the stag became Aidan’s emblem, and the school’s too. When I got my letter inviting me for an interview, the stag’s antlers were the first thing I noticed, right at the top of the letter, like two little jagged black tears in the paper. The first time I saw St. Aidan the Great School was when I went for my interview. It was one of those sunny midwinter days, all glittering frosty fields and long, low shadows. Dad drove me through the gates and up this long driveway through lush green grounds in his ten-year-old Mini Cooper. At the end of the drive, we got out and just stared and stared. We’d seen some pretty amazing scenery on the long trip from Yorkshire to Northumberland, but this was the best of all. It was a beautiful, vast medieval manor house, with a sort of moat and a little bridge to the entrance. It didn’t look at all like the headquarters of a disturbing cult, which is what it actually is. The only clue, if I’d been looking for it, might have been the pair of antlers over the great door. “Another Country,” I said shakily. Dad didn’t nod, or murmur, You can say that again. He said, “If . . .” My dad is a wildlife cameraman, and he loves films of all kinds, not just the nature documentaries that he mostly works on. We watch loads of films together, from obscure subtitled films to the stupidest brand-new blockbusters. I’m even named after Greer Garson, a film star from the black-and-white days. When Dad’s traveling, or on night shoots, I watch films on my own, just to make up for the thirty-year head start he has on me. We have this game that we play; when something we see reminds us of a film, we say it out loud, and the other person has to name another film on the same theme. Now we were doing films featuring private schools. “And,” he said, “Zéro de Conduite.” “Ooh la la,” I said, “a French film. The gloves are off.” I thought hard. “Harry Potter, films one to eight,” I said, a bit shakily. “That’s eight points.” Dad could obviously hear the nerves in my voice. He knows so many films that he could have beaten me easily, but he must have decided that today wasn’t the day. “All right,” he said, giving me his lopsided grin. “You win.” He looked up at the grand entrance and the antlers over the door. “Let’s get this over with.” And we did. I had the interview, I did the exam, I got in. And eight months later, at the beginning of autumn term, I was walking through the entrance of the school, under the antlers, as a sixth-form student.